I really enjoyed this book. It's a compulsive read. It starts with police being called to an address in south London where a man has died, there is then speculation that even though the death seems to be by natural causes there may be a more sinister story behind it. There is a mysterious man who keeps appearing to the police officers and claiming that he knows there is more to the man's death, and that it may be linked to other recent deaths. 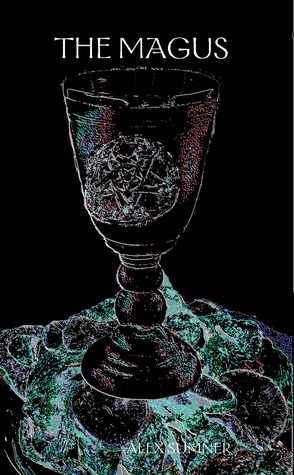 The book takes a look at the subjects of satanic rituals, clairvoyance, mysticism, black magick, the occult. The Magus is full of believable characters which gives the book a realistic feel. It's an intriguing murder/mystery with a twist of the paranormal. It kept me hooked and I am now looking forward to reading book two in the series. The Magus is suitable for readers over the age of 18 due to explicit content. This is an occult thriller / urban fantasy story set in modern London. You've heard of "police procedural novels" - well this is a "black magick procedural." It starts off like a murder story, but soon the detectives are forced to question their long-standing beliefs as they begin to suspect that dark forces are at work.The best way to describe it would be like an intelligent version of a Dan Brown story. Be warned, there are some scenes which are definitely Adults Only, whilst some of the depictions of the sorcery will leave a "foul taste in the mouth." Otherwise I enjoyed it immensely. Alex Sumner - I am a novelist and writer on the occult. After having written several non-fiction articles for the Journal of the Western Mystery Tradition, in 2009 I came out with my first novel "The Magus." Since then I have written "Opus Secunda" and "Licence To Depart," which make up parts two and three of "The Magus Trilogy," and a number of other works in the series "The Demon Detective and Other Stories. "My latest novel, "Taromancer," was published on Kindle in 2013, attaining Best-Seller status on the day of its official release. It is available in print from March 1st 2014.I am also an astrologer, tarot reader and ceremonial magician, and a blogger on all things occult.I live in Essex, England.